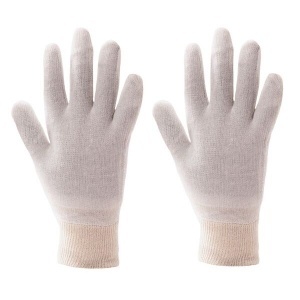 Highly lightweight, warm and comfortable, the Portwest Stockinette Knitwrist Gloves A050 are suitable for use as a liner or on their own. They offer good tensile strength and are suitable for low-risk environments, providing additional warmth when the user needs it most. The Portwest Stockinette Knitwrist Gloves provide additional warmth and an extra layer of protection, proving to be highly useful in low-risk environments. Their thin and flexible polyester and cotton lining guarantees comfort, making them useful as both undergloves and as gloves on their own. The Portwest Gloves A050 are available in one size that should be suitable for most users because of their flexible design. However, to ensure a perfect fit, it is recommended that you measure the circumference and length of your palm and match the results to the table below.